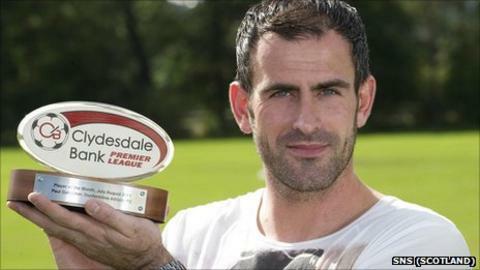 Dunfermline goalkeeper Paul Gallacher has been named Clydesdale Bank Premier League player of the month for July/August. The 32-year-old, in his second spell at the club, saved two penalties against St Mirren and St Johnstone. His impressive form has helped steer the Pars, who were promoted from the First Division last season, to fifth spot in the top flight. Gallacher returned to East End Park in the summer. Capped eight times for Scotland, he began his career with Dundee United before moving to Norwich in 2004. Gallacher joined the Pars initially on loan, in 2007, before making the move permanent. After enjoying two seasons with SPL rivals St Mirren, he returned to East End Park in June.